What government commissions the developement of a special virus for which there is no known human immune response? Ours did. Who were they intending to use this virus on? Apparently, us. — washed sheep red blood cells. There is much more to the vaccine deception than this excellent article. There’s peanut oil in the vaccines! I not only found that peanut oil can be used, it is considered GRAS, does not have to appear on the package insert, and is considered a protected trade secret so you have no right to know that you are subjecting your child to a 1 in 125 chance of getting a fatal food allergy when you have your child vaccinated. Vaccines have never preventd anything, apart from health, sanity and common sense. I have come to the conclusion that vaccination is an organised criminal enterprise dressed up as disease prevention. Well folks sometimes the truth is a little hard to digest when it comes to giving up the ingrained belief that we have all been conned into accepting that the alleged ‘pathogenic viruses’ are really out there and are the sole cause of many human diseases. However, until proven otherwise Dr Stefan Lanka’s (virologist and molecular biologist) claim that no complete natural human disease causing viruses have ever been physically isolated directly to date by ANYBODY remains unrefuted. That also applies to the viral constituents of the MMR vaccine which is alleged to be based on ‘a mixture of live, weakened viruses from measles, mumps and rubella’. First of all how can bits of nucleic acid (an inert chemical) wrapped in a protein coat (another chemical) be ‘alive’ in a vaccine????????????. Viruses are NOT living parasitic organisms in the strict sense, they consist of inert chemicals pure and simple – bits of RNA or DNA mainly with a protein coat. No scientist to date has ever physically isolated an alleged human disease causing virus directly dead or alive, that’s right, NOT ONE.This may come as a shock to most people, but that’s the truth as far as can be determined. Here’s an example of what is tantamount to scientific fraud. According to various past reports Dr Jeffrey Taubenberger, a molecular pathologist at the Armed Forces Institute of Pathology in Rockville, Md., and his team toiled for 10 years to piece together the alleged deadly Spanish Flu virus in a high-security laboratory at the Centers for Disease Control and Prevention in Atlanta. They obtained samples from small pieces of lung tissue, preserved in wax after the autopsies of two soldiers among the Spanish flu’s 675,000 American victims, and from the frozen body of an Inuit woman who died from the virus in November 1918 and was buried in the Alaska permafrost. The claim is then made that although the alleged virus’ eight gene segments, or strands of RNA, were in fragments (selected from numerous ‘other’ fragments), Taubenberger’s team was able to piece them back together using gene sequencing and polymerase chain reaction (PCR) — a biochemical multiplication method of creating copies of specific fragments of DNA. The glaring problem here is that the ‘Spanish Flu virus’ has NEVER been physically isolated by a DIRECT method, photographed and biochemically characterized in the first place scientifically by ANYONE to date. Taubenberger et al had to rely on a purely speculative conceptual ‘model’ and the magical PCR technique that produces something out of nothing – short bits of gene substance that were NEVER demonstrated to exist in the corpses in question! How is it possible to know what to look for and be able to identify and determine the Spanish Flu virus precisely from ‘virus-like particles’ such as cell debris and other organic contaminants if the model Taubenberger et al used was NEVER based on a real physically isolated and biochemically characterized virus at all? Thus with the magical PCR method it’s not only possible to multiply arbitrarily so that one detects only small fragments of new nucleic acid sequences that did not previously exist in the tissue samples from the corpses. It also means that a positive PCR is not proof for the existence of a whole genome (‘viral’ or otherwise). ”If viruses had been present, then these could have been isolated, and out of them their gene substance could have been isolated too; there would have been no necessity for anyone to produce laboriously, by means of PCR technique- with clearly a swindle intention – a patchwork quilt of a model of the genetic substance of the idea of an influenza virus”. Finally, and notwithstanding all this. PCR reproducibility and specificity have never been effectively determined using any isolated human pathogenic virus as a ‘gold standard’. Moreover, Kary Mullis, who received a Nobel Prize for inventing PCR, says that it is being misused in HIV research. It is a method for studying genetic code fragments and matching them to similar fragments, not for identifying viruses as the cause of AIDS or ANY OTHER ILLNESS [emphasis mine]. He says that humans are full of retroviruses, which have never been shown to kill anybody, and that the mystery of ‘HIV’ has been generated by the $2 billion a year being spent on it (FOTI, Roberts p. 191). In the case of influenza the problem thus remains: what is it that is producing the flu-like symptoms that are invariably credited to the so-called human ‘pathogenic viruses’ if none of them have ever been proven to physically exist let alone to have been effectively isolated and biochemically characterized to this day? What we have been led to believe about human pathogenic viruses is Alice in Wonderland phantasy along with the standard textbook pictures and speculative computer models of their alleged genome sequences. The same applies to their alleged monocausal status. To say that virus ‘x’ is the cause of disease ‘y’ presupposes what is never proven. namely that all other possible causes of the disease in question can be miraculously and effectively excluded! The emergence of Vaccine induced Diseases | Canada For Truth – Be a catalyst for change! I didn’t vaccinate my kids back in the 80s. There was no evidence then and there is none now, that vaccines have played any role in the reduction of infectious diseases. Dr Fred Klenner cured polio and every other infectious disease in the 1940s with intravenous vitamin C. Every doctor who followed his protocol had the same success. Was the wider medical community beating a path to his door? I would be asking why they want to vaccinate when he already has a compromised immune system. Our baby who is eight and half months now has not been vaccinated. Although, he was dignosed three days into his life with Cystic Fibrosis. He has been thriving, doing very well but the doctors we deal with and will continue to deal with would like us to immunize our son. We are uncomfortable with doing so but we feel pressure to do something because of our son’s disorder. Anyway, can anyone give us some feed back here, it would be greatly appreciated. Response to Tony. “I cannot find one scientific paper that claims…said virus causes the same disease…in an otherwise healthy human being.” Then why are these vaccines administered? Can you find one scientific paper that claims to have caused the healing of just one cancer or any other disease that can directly be linked with the particular vaccine that was administered for that purpose? Can one claim with 100% certainty that at least it prevented the cancer? No, so why vaccinate? to KevinNelson, the alleged “public health professional” with orthographic disabilities: You are talking straight from the pharma-paid test-tube of public brainwash. Forget what they taught you (@ university?) and try logic and common sense for a change! Headmaster of the medical school I attended for 5 years (Prof. Dr. – accredited by the WHO) advised us to refrain from all vaccinations when my daughter was born – back in 2005. We moved from Germany to South-America (tropical djungle) when she was 8 months old. Never having seen a hospital or any pharma-products she has become the most prosperous and healthy 5-year-old power-girl you may know! Her immune-system is obviously much stronger than all of her peers´. Check the sources of the statistics you quote and who reaps in the profits. “Public health officials” may be well-intended but, if they truly did their homework, they would be looking for another job. The willfull ignorance of “public health officials”is maddening. Your statement about Wakefield is inaccurate at best. And your opinions about vaccines are based in wishful thinking. I’m sure most teachers are well-intended too but they participate in a system that is deliberately dumbing down and drugging our children, as required by “public education officials”. Humans have been, are being and will continue to be farmed in various ways until we wake up and smell the anti-septic gel. However, we also farm the animals, vegetation and minerals we use as resources for nourishment and increasingly manipulate their structures and genetics for more efficient harvesting of their bodily nutrients. There is a somewhat – to me anyway – balanced horrific reflection in these two processes. I hope everyone will wake up soon. There is no conclusive scientific evidence that stands up to rigorous scrutiny that viruses actually CAUSE any disease. Sure enough there is a multitude of virology text books showing computer enhanced models and alleged electron micrographs of such deadly pathogens not to mention the reems of ‘peer-reviewed’ scientific papers that claim to have isolated such viruses that allegedly cause disease. However, I cannot find one scientific paper that claims to have isolated a whole pathogenic virus from a fresh tissue sample of a diseased human being by a DIRECT method of isolation and proved without doubt that the said virus causes the same disease in an otherwise healthy human being. I find that rather strange because as the theory goes virus would be most abundant in the plasma early on in the ‘infection’ and easy to isolate from a sample. If anybody knows of any such primary reference source together with the name of the scientist(s) who have made the claim and where the experiments were conducted that refutes what I have stated please post it. Until then all claims that viruses cause disease remain highly speculative and unsubstantiated by hard scientific evidence. We seem to be living in a world where pathogenic viruses are believed and feared by almost everyone as one of the predominant causes of disease. I watched a film the other night on a human flesh eating virus, such horror films and books abound like the ‘Andromeda Strain’ or Stephen King’s novel ‘The Stand’ where a government spawned ”superflu” virus wipes out more than 90 % of the earth’s population. Such ideological material reinforces the fear of these ALLEGED deadly viruses in the human psyche – but viruses that remain scientific fictions until proven otherwise. Absolutely right on target here. I have been gathering information for eleven years and have forwarded this kind of info on to family, I have grandchildren, and friends and shall do so again with this updated material. Read “Horrors of Vaccination” by Chase Higgins 1920, Emerging viruses by Leonard Horowitz 1996 and the Simpsonwood memos….. 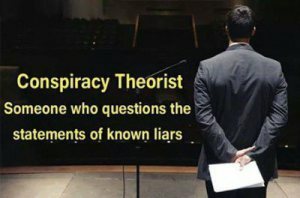 Denial is a psychological issue and conspiracy is everywhere…when two or more people get together to decide on something that will benefit them more than others that is conspiratorial in nature. Try finding where facts and fiction meet. Just like all military members are brainwashed that war is good and just all doctors flying out of the MD mill are brainwashed to regurgitate that vaccines provide more benefit than risk and are always “safe and effective”. Until we realize that we are destroying the human genome we will continue to believe that the world is flat…. Continue to tow the status quo or change your paradigm. Also…Dr. Wakefield, while being targeted and intentionally discredited was finally vindicated. What happened to Wakefield is what happens to anyone who talks outside the approved mantra. Anyone who dares to speak what they believe to be true is ostrcized, publically denigrated, has their careers destroyed, and their names tarnished. We only elevate the compliant. Those who do and say what they are told. Later, usually much later when it no longer matters, it is revealed that they were right. We kind of knew that anyway. Not that it matters……the damage is done. Maybe you missed the part where the government commissioned by public the creation of what we now know as AIDS. Not conspriatorial…..just a product of John Merck. The AIDs virus was launched simultaneously in manhattan and Africa using free HEpB vaccines as the vehicle. Many of those who recieved the polio vaccines now have cancer as 60 various labs have confirmed. The Sabine polio vaccine contained SV 40 a known wild virus that causes cancer. Even after the SV40 was identified in the early 80’s, the stockpile of that same vaccine was used til it was depleted in 1992. now we are seeing the resulting cancers from these vaccines. The yellow fevere vaccine contained a wild virus that caused leukemia. They still use it. The polio vaccine caused the direct deaths of more than 8,000 Nigerian children and left thousands more crippled for life as the polio virus used to make the vaccine was unstable. During the fake flu pandemic last year, a contaminated batch of hundreds of thousands of doses of “vaccines” were discovered which would have caused wide spread deaths. It turned out the contamination with the live virus was no accident. I could go on…….but the fact is, measles, mumps and other childhood diseases were in great decline when these vaccines were introduced. And yes there were instances of children who became so sick they died from these diseases. The fact is, more have died or suffered permanent injury from these vaccines. You cannot load heavy metals, mecury, thimerosol, necrotic tissue, biological debris, viruses, bacteria and whatever came off the floor into a needle and tell me you cured, helped or stopped anythiing. Ask the parents of the thousands of girls now permanently damaged or dead from Gardasil. This vaccine has been effectively discounted as a preventative for cervical cancer or anything else for that matter. So what is its purpose? And vaccines do not PREVENT anything. The claim is that somehow if you become infected with whatever the target disease is, you won’t get it so bad. No vaccine manufacturer claims vaccines prevent anything. the sub-clinical infections of measles is 3 times greater after vaccine than wihtout vaccine. Thats a fact. It is true that there may be some truths to the side effects associated with some vaccines, but at this point, as I public health professional, I am unprepared to accept that vaccines are deliberateky used as a agent of depopulation. The author does not mention, that vaccines have helped reduce the sourge of many diseases that were particularly hard on children such as polio, mumps, measles, tuberculosis, and rubella. Without vaccines, the life expectancy would be considerably lower. 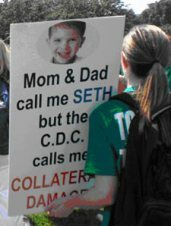 Also, Dr. Wakefield’s links between thimerosal and autism have been largely considered to be fraudulent by the scientific community and Lancet retracted his study. I also believe most respected HIV researchers dismiss the idea that HIV was created in a testube and believe it was a naturally mutated version of the SIV in Aftrica. While the author is right to point out that the vaccination is not without side effects, this article is highly conspiratorial in nature and does not do justice to the many public health professionals who are trying to reduce the prevalence of various infectious diseases. First step in revising the system—Kill all the lawyers!!!! !